This cold season is getting into me... I can't wait till its summer again where we can go for a walk everyday and the kids can play in the playground and do the things they love outside. 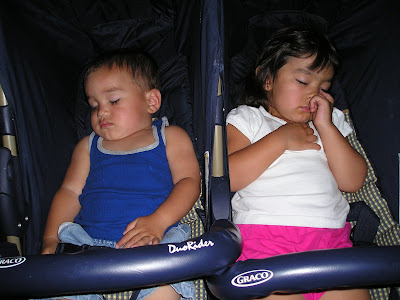 Usually when we go for a walk during summer days, our children fall asleep like the photo below right before we arrive home. This was originally posted by my husband in this blog on February 22, 2009. This is the best stage in the growth of their lives. You will, soon enough, come to the stage where you will wish that they WOULD sleep! they look cute still even when asleep :-). enjoy while it, before you know it, they wouldn't want to sleep or nap at all anymore! I bet your babies can't wait for the summer as much as you do Mr. Joops..
Oh, my! They're so precious! so cute!...oh, man it feels summer here already...just today lang we reached 95deg...this week nasa mid 80s yung weather dito sis. Awww...they're sleeping so peaceful mare. what a sweet photo of your kiddos! they sure look very calm and peaceful in their sleep.